It's now a play! And you can buy a copy of the script! 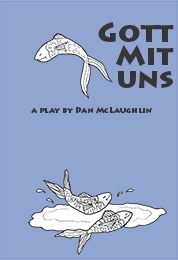 Gott Mit Uns” by Dan McLaughlin takes the audience on a journey to recover a goddess in the form of an oversized penguin in a world ruled by forms and bureaucrats. The audience will meet two InterDeitific Conflict Resolution Agents (IDCRAs) who spend their days processing requests for personal blessings and curses. But when the resolution agents mix up requests, a Deity Ignored No Longer Worshipped Anymore Resulting in Curtailment (DIONWARIC) is summoned to the world to resolve a grade dispute in a religious studies class. To complicate this processing error even further, the ignored goddess comes to Earth in the form of an eight-and-a-half-foot penguin. Armed with their new Vocal Oversight with Continuously Explained Rules for Action (VOCERA) device, see the two agents venture forth to bring back the oversized, flightless bird. They track her through modern academia and modern Hollywood, where she proves to be remarkably effective as both an entertainer at children's parties and as a consultant on sword and sorcery movies. Throughout their travels, the agents and goddess pass through other adventures, including a modern high school, and a pie-baking competition. “In a world where religion is seen as a ‘wedge’ issue, this play finds humor and room for thought for people of all persuasions,” McLaughlin says. "It also looks at what happens to people when filling out forms becomes their life. McLaughlin’s inspiration comes from his questioning of what happens when people of different religious faiths pray for varying results to the same event – and why people even bother to pray. In “Gott Mit Uns,” the author reflects on a problematic world where a powerful bureaucracy exists between different gods and what it does to the people who live there.